From melting chocolate to steaming vegetables to popping popcorn, microwaves are useful for all kinds of cooking tasks, both big and small. But, what if you have a compact kitchen or very little spare counter space? You don’t have to let a lack of space stop you from owning one of these useful kitchen appliances; you can find a wide range of small microwaves perfect for squeezing into compact spots. Although small microwaves have a few limitations due to their size, you can still cook all but the largest items, and will more than suffice for those living alone, couples, or even small families. We reviewed dozens of small microwaves to identify the best of the best. To help us pick the best ones out there, we focused on a range of factors, including internal and external dimensions, programmed settings, ease of use, wattage, and average customer reviews. During our extensive research the Panasonic NE-1025F stood out as clearly being deserving of our tip pick spot. Although it’s technically a commercial model, that simply means it does its job better than most consumer microwaves. It’s simple to use, with a dial control and a basic cooking guide with recommended times listed on the front. 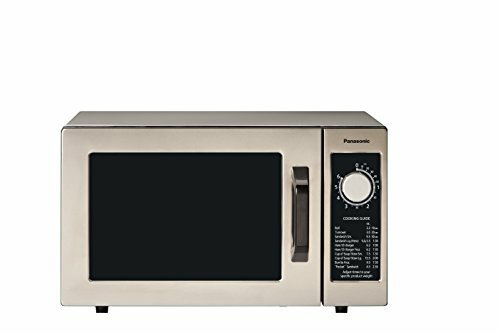 With an internal capacity of 0.8 cubic feet and external dimensions of approximately 20 inches long by 16 inches deep by 12 inches high, the Panasonic NE-1025F Silver 1000W Commercial Microwave Oven isn’t the smallest microwave on our list, but it’s still a lot more compact than many of its competitors, especially other commercial grade microwaves. If you’re looking for something that’s simple to use, look no further. This small microwave features a single timer knob—no push-buttons, preset programs, or variable power settings—so you simply turn it to the desired cooking time and away you go. While this level of simplicity isn’t everyone’s cup of tea, many users find it refreshing. It also means there’s less that can break or go wrong. One of the main things that set commercial microwaves apart from consumer models is their rugged build. The Panasonic NE-1025F is built to last! What’s more, it features a hidden rotating antenna rather than a rotating turntable and the rest of the inside is completely smooth, making it extremely easy to clean. With a fairly hefty price tag of around $280 (though Amazon Prime members can buy it for somewhere close to the $220 mark), this is likely to cost too much for occasional microwave-users. 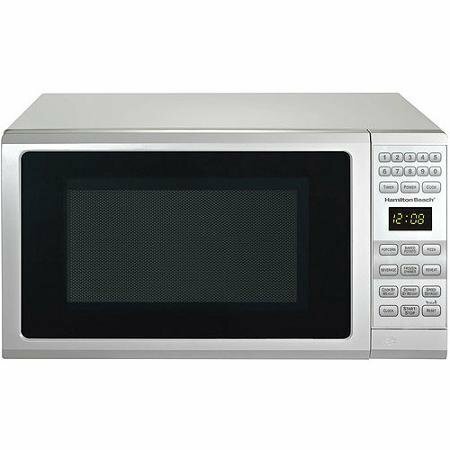 However, this product has exceptional reviews, so if you use you microwave a lot, or simply want a sturdy model that will last for many years, this one comes highly recommended. 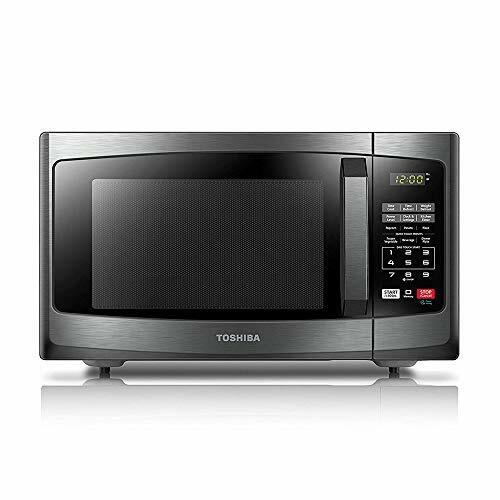 If you’re looking for a high quality small microwave but don’t quite have the budget for our top pick, consider the Toshiba EM925A5A-BS Microwave Oven. Retailing at roughly $90, it’s much more affordable, but is still an excellent choice. It might not be quite a rugged as a commercial model, but makes up for it by sporting a wide range of handy features. If you’re not sure how long to cook various foods for, the six preset programs will make your life easier. For anything that’s not in one of the presets, you can easily set your own times with the one-touch system, and even program your own multi-stage cooking instructions. While it has a maximum power of 900 watts, you can choose between eight different power settings, which is useful when cooking foods that don’t require full power. The overall external measurements are 19.2 inches long by 15.9 inches deep by 11.5 inches high, which is small enough for most kitchens. The internal capacity is 0.9 cubic feet—slightly larger than our top pick. It might be a basic model, but the Hamilton Beach 0.7 cu ft Microwave Oven is a great choice if you don’t do a lot of microwave cooking or you simply don’t want to spend a lot. At roughly $55, this compact microwave certainly won’t break the bank. Despite its low price, users have generally found it reliable, though it might not hold up to heavy duty use. Just because you don’t want to spend much on a microwave, it doesn’t mean you can’t get a highly functional model. This microwave offers six programmed settings, plus the ability to set your own time, if you know how long you need to nuke your food for. With a choice of 10 power settings, you can make use of the full 700 watts or opt for a lower setting. With dimensions of approximately 20 inches long by 16 inches deep by 13 inches high, we’d certainly class this as a compact microwave, although it is slightly larger than some other 0.7 cubic foot models. If you’re looking for a small microwave that’s not too long, but you don’t mind a bit of extra height, the Whirlpool WMC20005YB 0.5 Cu. Ft. Black Countertop Microwave is what you need. It measures approximately 15 inches wide by 14 inches deep by 14 inches tall, with an internal capacity of just 0.5 cubic feet, making it one of the most compact options on the market. The turntable inside has an 11-inch diameter, so you can still easily heat a plate of food or pop a large bowl of popcorn. We love the unusual rounded back, which means this microwave can fit neatly into corners, making it a real space-saver. The Whirlpool WMC20005YB has an all-important preset popcorn setting, but apart from that you’ll need to manually enter your desired cook time. You can select between a range of power settings, up to a maximum power of 750 watts. While we’re a huge fan of this microwave, it does come with a fairly high price tag of around $150, so you might prefer a slightly less costly model, unless you’re dead set on having a microwave that fits in the corner. Want a microwave that can also broil, air fry, and bake? 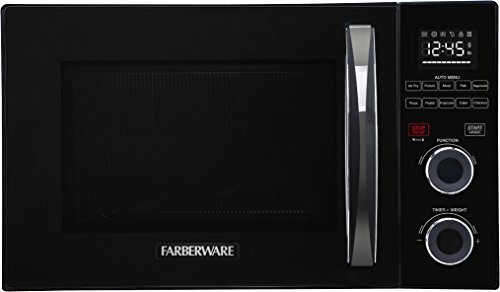 Check out the Farberware Gourmet FMO10AHSBKA Microwave Oven! The convection feature means it cooks food on the outside, rather than just heating it from the inside, like a regular microwave. Effectively, this means it can bake and brown food—you can even bake cookies and pies. In addition to its convection function, this model also offers a broil/grill and an air fry function. With external dimensions of 20 inches long by 20 inches deep by 12 inches high, and an internal volume of 1 cubic foot, this is the largest option in our top five, but it’s still one of the smallest convection microwaves available. Due to its compact size and versatility in the cooking arena, it’s the perfect choice for dorm rooms, RVs, and other places where you might not have a full kitchen with a stove and oven. The intuitive controls allow you to select between the different cooking functions, set the cook time, or select from various preset programs. Although it’s not cheap, at roughly $200, its wealth of features definitely make it well worth the cost! Microwaves are extremely handy cooking appliances that can carry out a wide range of tasks. If you’d like to have a microwave, but you don’t have a lot of counter space, then a small microwave is for you. This way, you can reap all the benefits of having a microwave without taking up basically the whole of your kitchen. You might also choose a small microwave if you usually cook for only one or two. If you’re not cooking for a large family, owning a mammoth microwave is pointless! Internal capacity. Small microwaves generally have an internal capacity of less than one cubic foot. The most compact options have a capacity of 0.7 cubic feet or less. External dimensions. It’s also important to consider the external measurements of your chosen microwave. Usually, the smaller the internal capacity, the smaller the external dimensions. However, some small microwaves are cleverly designed to maximize capacity while minimizing external size. Power. The power of a microwave is measured in watts. Most models have a maximum power of between 700 and 1,000 watts, though you may find some that are more or less powerful. The higher the wattage, the quicker the microwave cooks food. A handful of microwaves only allow you use them on the maximum setting but most offer a range of power settings for when full-power isn’t appropriate. Preset programs. Many microwaves feature preset programs for cooking certain types of foods, such as baked potatoes or popcorn. These are useful if you’re not well-versed in the art of microwave cooking and aren’t sure how long to nuke things for. That said, even if you do know your way around a microwave, preset programs are a time-saver. Ease of use. You’ll find some microwaves with just a simple cook time dial and a start button and others with touchpad or digital controls. Which you find simpler and more intuitive to use is down to personal preference. Ease of cleaning. To make cleanup easier, your microwave should be as smooth as possible on the inside, without awkward nooks and crannies where food can get stuck. If your chosen microwave has a turntable, it should be easy to remove and clean. What are the dimensions of a small microwave? There are no exact dimensions for a small microwave, as everyone has their own idea of what’s compact and what’s not. Any model that’s smaller than average could be classed as a small microwave. You generally can’t find microwaves much smaller than around 17 to 18 inches long and 10 inches high, so we’d consider any microwave within a couple of inches of these dimensions to be small. If you’re in search of a small microwave for a college student, you should also check out our review of the best dorm room refrigerators. What is the standard size of a microwave? While microwaves don’t have a standard size, an average mid-sized microwaves generally measures somewhere close to 24 inches by by 16 inches deep by 14 inches high, with a capacity of 1.5 cubic feet. What is a good wattage for a small microwave? We’d generally recommend looking for a small microwave with a wattage of between 700 and 1,000. A 600-watt option is okay if you’re on a budget, but it won’t cook as quickly or evenly as more powerful models. It’s rare to find a small microwave with more than 1,000 watts of power. Are built-in microwaves standard size? Built-in microwaves come in all kinds of size. If you’re looking for a microwave to fit into an existing slot for a built-in microwave, you’ll need to choose a microwave with the same dimensions as the space in question. However, if you’re remodeling your kitchen, you get to choose what size built-in microwave you need. In this case, you can use a small microwave as a built-in microwave, if you want to. We looked at 20 other small microwaves. Even though they didn’t make our 5 best small microwaves list, they’re the best of the rest and each is still a great option. The information you’ll need to compare each one is included with the listing. While it isn’t the most powerful microwave on our list, the Black + Decker measures just 17.3 inches long by 13.97 inches deep by 10.17 inches, making it one of the most compact. This simple microwave doesn’t have all the bells and whistles, but it stands out for its cool retro look. It comes in white, red, or mint green. With six preset programs plus a simple “express cook” function, microwave cooking doesn’t get much easier than this. Choose from three color options: black, white, or stainless steel. With a 0.7 cubic foot capacity and exterior dimensions of 17.3 inches long by 12.99 inches deep by 10.14 inches high, this small microwave should fit even the most compact kitchens. This smart-looking stainless steel finish microwave measures approximately 17 inches long by 13 inches deep by 10 inches high. An exceptionally compact model, measuring just 17.7 inches wide by 12.5 inches deep by 10.2 inches high. As it’s significantly less deep that many competitors, it’s perfect for anyone with shallow counters. Packing a full 1,000 watts, this microwave is extremely powerful for such a compact model. Ideal if you need something small, but want to cook quickly. It might have a fun retro appearance, but this compact microwave isn’t all style over substance. With 12 pre-programmed settings and a delay timer, this is a highly versatile machine. With an internal capacity of just 0.6 cubic feet, this microwave might be too compact for some, but it has a small footprint of just 17.75 inches long by 12.5 inches deep by 10.25 inches high. 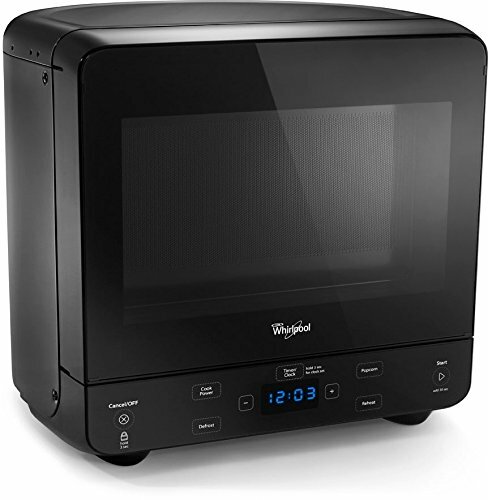 A quality small microwave that comes from a respected brand and is built to last. It does, however, have slightly larger external dimensions compared to other 0.7 cubic foot models. This 1 cubic foot, 900-watt convection microwave features standard microwave, grill, and convection functions. What’s more, it’s very reasonably priced for a convection microwave. Although this is one of the largest models on our list, measuring roughly 20 inches long by 20 inches deep by 12 inches high, it’s still very small for a convection microwave, especially when you consider the reasonable 1.1 cubic foot capacity. This built-in over-the-range convection microwave packs 850 watts of power and gives excellent results overall. Just be prepared for a hefty price tag. This compact commercial model might only stand up to “light” kitchen duties, but in home-use terms, that means it’s a rugged workhorse of a machine! It might be on the larger size of small, but it’s still much smaller than an average microwave, and performs well with its 900 watts of cooking power. This impressive 900-watt smart microwave is WiFi enabled and Alexa-compatible, so you can control it via an app or using voice-commands with your Echo hub. A basic, yet highly-functional small microwave with an attractive red finish. Its 0.9 cubic foot capacity is compact but not too small to cook larger amounts. Measuring roughly 19 inches long by 14 inches deep by 11 inches high, it might be slightly too large for the smallest kitchens, but it’s still far from large. A reliable small microwave with easy-to-use press-button controls and a bright, clear LED display. The 10.6-inch turntable fits most standard dinner plates. This simple and affordable microwaves features easy-to-operate digital controls and has a compact 0.9 cubic foot interior capacity.